Most people have heard about blockchain technology. It's the basis for cryptocurrencies. It came on the scene a decade ago, when the great recession, demonstrated the dangers that lurk in the financial world. The blockchain promises a new kind of transparency and security for transactions of all kinds. Some say it might revolutionize not only the financial world, but society as well. Imagine you have a dollar bill that, every time it changed hands, could remember exactly where it had been, what it had paid for, and for whom. And everyone in on the transaction could see and track that history forever. That's the concept behind blockchain technology. But instead of a dollar bill, its computer code. Bernadette Kogler is the CEO and co-founder of RiskSpan, an Arlington firm, focused on the consumer lending industry. "Roughly three years ago, we started experimenting with blockchain and we see it as a way to provide transparency to a broken market, basically post financial crisis." She sees the mortgage meltdown as a lack of trust and the blockchain as way to restore it. "It's the tools that are also imbedded in (the blockchain). This idea of consensus and verification of the information that's posted to the blockchain." Experts say blockchain technology, with its forever embedded notations, could play a role in virtually every sector of our economy. Take, for example, a real estate title search or tracking a piece of equipment as it's made and shipped and shipped again. And the list goes on and on. That's why it's being called the next economic disruptor. Virginia Tech economist, David Bieri recently hosted a symposium on blockchain technology. "There are lots of firms out there whose only job is to verify information just because that information is lives in different systems. These firms would all be gone," Bieri says. Bieri is interested in the broader, societal implications the blockchain may usher in. For the most part, he says, "the conversations have always been around cryptography, computer 'science-y' stuff. When in fact," he says, "the fundamental societal implications are really the ones that are the most explosive and transformative." 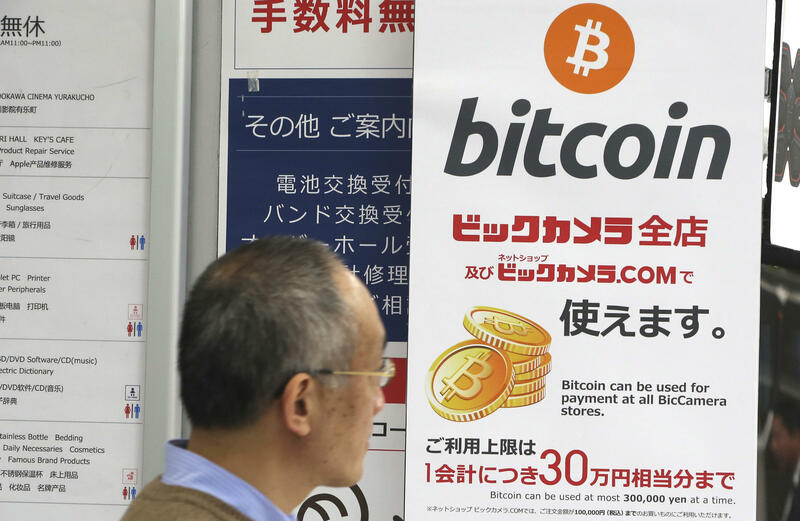 A man walks past a poster of bitcoin displayed at a retail store in Tokyo. Blockchain is a decentralized technology that can make transactions safe and secure, but crypto-currency exchanges that trade bitcoins and other virtual currencies that are based on this technology have been hacked because they are not working on secure networks. Bieri points out, "there is such a thing as crypto libertarians, who are now seeing this technology as the god-send that allows us to run a monetary system that doesn't need a 'Fed' at the core." There's been debate about the Federal Reserve since it was established in 1913, and some have called for abolishing it. But not everyone share's that ideology, says Daniel Breslau,who teaches Science, Technology and Society at Virginia Tech. He doesn't buy "this idea, that the technology comes along and transforms the world. That's really not how it happens. It's really technology plus changing practices, people finding something they can do with it. If they want to change the world, they find technology is a tool." Bieri says debates like these are the reason he organized the first blockchain symposium in Blacksburg. "Because this stuff is happening, so we better learn how to have a meaningful conversation about it in terms of the types of values that are being coded into the system because remember it is coded by humans. And in that sense, no technology is neutral. It doesn't detract from the blockchain's revolutionary potential, but we have to have a clear idea and set of conversations about what it is that we want." Bieri will be involved in shaping a new curriculum on Blockchain technology at Virginia Tech. He's planning a second symposium on the topic for next year. Blockchain technology could become the next great communications platform. It promises to provide both transparency and security to transactions of all kinds. And Blacksburg, Virginia is poised to become a center for its development.